Island 5 is also known as Koh Haa Yai –’ large island’. Due to its size, and being out to the south-southwest of the small archipelago, there is a lot of interesting coastline and opportunities to see some of Koh Haa’s best marine life. Island 5 is the outermost island of the group and therefore its southwestern corner is exposed to some open sea, bringing rougher conditions but also chances to see some sharks, rays, and bony fish which don’t spend all their lives here. Hard Corals Photo by Emmy AhlénThe Drop Off on the southeast corner is a very interesting spot, as the depths and location mean that there’s some marine life here which is not normally found in The Lagoon and the shallower and calmer diving spots around here. The limestone island juts up beautifully out of the sea and even under the surface the topography is very interesting. Sea fans, hard and soft corals, and boulders provide home, food and shelter for lots of smaller fish and invertebrates. At all depths, there are pelagic schooling fish and those which swim around alone. Divers Photo by Emmy AhlénOn the northwest corner of Island 5 are a two or three sites, but they are usually incorporated into one dive. Three are located from the north face across to the west. 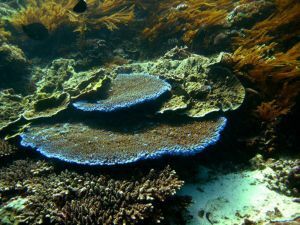 They don’t tend to receive as many diving visitors as most of the rest of the archipelago, but when conditions suit this area can be very exciting, especially if and when large filter feeders are in the area. There is also a very small bay at Island 5. The pristine sandy beach there is the shallow area of the dive site, and referred to some as ‘Coral Beach.’ The hard and soft corals here are home to lots of reef fish and invertebrates, with other creatures visiting to feed. From time to time a turtle or sea snake is reported here. 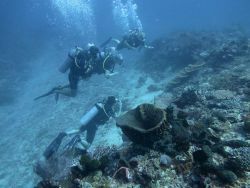 Generally, the conditions are easy here, but the diving isn’t anything special, and those looking for a calm and protected bay and beach to dive from usually choose The Lagoon.